The Product Farm has these awesome "wine tumblers" (basically wine sippy cups). Actually, they're so awesome that they're currently sold out. I hope they get restocked soon because I need to order one for my sister for Christmas. Space Janitors is a new web series on Youtube on the Geek and Sundry channel. Just watch it. 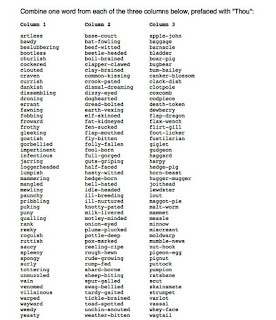 My husband found a list of Old English Insults that are hilarious for, you know, when you want to insult someone whilst sounding like a sir. Have fun with this one. I know I will! The last thing for this month that I've been doing a lot of is playing around on my iphone my sister got me for my birthday because her and my brother-in-law are awesome. I've been downloading and trying new apps almost every day... OK, every day. I can't help it! There are just so many awesome things! 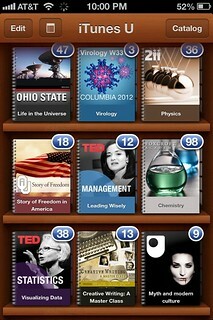 I decided to try iTunes U, an educational app. I geeked out when I found out you can follow courses on so many different subjects. Today I started the course "Life in the Universe" from Ohio State. If you're interested in the idea of finding life outside of earth I'd recommend the course. Also, as a bonus, no homework. Learning for free without the torture of homework and fear of bad grades? Count me in!